Net browser Opera 8.0, due for official release at the end of next month, will be "the most accessible browser on the market", according to its authors. The latest version of the net browser can be controlled by voice command and will read pages aloud. The voice features, based on IBM technology, are currently only available in the Windows version. 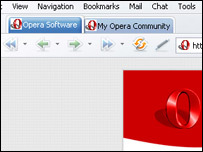 Opera can also magnify text by up to 10 times and users can create "style sheets", its developers say. This will enable them to view pages with colours and fonts that they prefer. But the browser does not yet work well with screen reader software often used by blind people, so its accessibility features are more likely to appeal to those with some residual vision. "Our mission was always to provide the best internet experience for everyone," said Opera spokeswoman, Berit Hanson. "So we would obviously not want to exclude disabled computer users." Another feature likely to appeal to people with low vision is the ability to make pages fit to the screen width, which eliminates the need for horizontal scrolling. The company points out that this will also appeal to anyone using Opera with a handheld device. The company says that features like voice activation are not solely aimed at visually impaired people. "Our idea was to take a first step in making human-computer interaction more natural," said Ms Hanson. "People are not always in a situation where they can access a keyboard, so this makes the web a more hands-free experience." Unlike commercially available voice recognition software, Opera does not have to be "trained" to recognise an individual voice. Around 50 voice commands are available and users will have to wear a headset which incorporates a microphone. The voice recognition function is currently only available in English. Opera is free to download but a paid-for version comes without an ad banner in the top right hand corner and with extra support. Opera began life as a research project - a spin-off from Norwegian telecoms company Telenor. Its browser is used by an estimated 10 million people on a variety of operating systems and a number of different platforms.